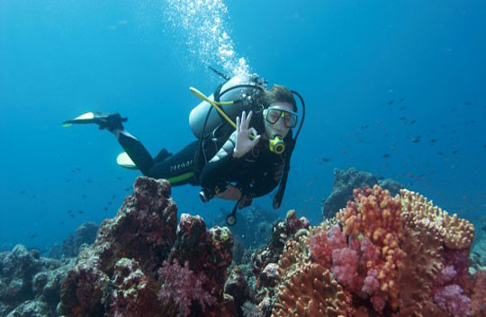 It had been a long cherished dream which i had thought to make reality one day.The dream was Scuba Diving.Right from the time i have learnt swimming( 7th grade) i wanted to dive and see the life beneath the water. For some unknown reason it was a attraction filled with curiosity.Deep blue water with fragile fish and dense coral with amazing snaps made it a fantastic experience for life. Scuba diving had definitely been qualified in must-do -before-die list of mine.I was waiting for the right opportunity though. I always thought scuba diving is extension of swimming. U just have to wear the apparatus and jump in the water with those light weight cylinder and beautiful fins and you are welcome to witness the beautiful underwater life in their surroundings.I was dying to become mermaid…….with pink fins(me being girl, excuse me of the fins colour) and invisible oxygen cylinder, my hair open floating in the direction of deep water –making me a perfect mermaid, what a dream. Finally me and vishal got a way to book the scuba diving experience. We thought lets try, no harm been mermaid in controlled atmosphere.I whispered to vishal, you would see the mermaid in me rolling all under the water and gliding so comfortably that you would forget i am human. The day(23rd june) arrived on which we had booked our session, it was 9am in the morning on Saturday.I exactly woke up at 9:5am and jumped out of my bed to hit the pool for the wonderful scuba diving experience. For the first time i dived with dive-line Ipswich.It was 9:30am by the time i figured out the place. The guy briefed me to come back next time as the session had already started.So he re-booked us on 6th August 2011. The mermaid in me was trying to come out desperately…….but somehow i put her to rest for few more days. 2) Pressure level on ears and lungs.Which ever part of your body has air, will be subject to more intense air pressure.As you go deep in the water you should be aware of how pressure works on your body.For simple reasons to be alive. 3) Apparatus:-Introduction, cleaning and fitting of fins, oxygen cylinder, air gauge and face mask. All dressed up and excited. We entered the pool.Our 1st objective was to learn how to breathe inside the water with the help of oxygen cylinder.The instructor carefully explained to all of us and showed us the demo. I was really impressed by him.He than asked us to dip ourself in the water and start breathing.I went inside and within 2 mins surfaced out……what the hell the happened? I couldn’t breathe, where is the mermaid in me.””””’hello….some one there…please come out””””’. The instructor followed me on the surface and again trained me on the breathing process. My observation made me realize i was the only one on the surface, all other participants where doing fine.Where is the mermaid in me…….let me call her mermaid mermaid…..no response.Guess she didn’t like the water or the fins colour( the one i was wearing was yellow)…. never mind let me give it a try.Vishal came twice to help me with my breathing couple of times. When we were on surface he made faces to me…..”’gliding in the water, i can barely see you in water”’ . I had bugged me with my excitement all the way till v started diving. Now it has his turn to bugg me on my non-performance. It took me 20 mins to figure out the right way to breathe.By that time the whole class was ahead of me….i was the only one struggling. It was such a wonderful experience to be weightless and breathing inside the water like mermaid.Finally, instrutour explained us the various safety measure taken in the water. We played disc for a while, had a small competition across the pool( You guessed it right, i was last) , experienced pressure 20feet inside and water and splashed lot of water on each other. Overall very satisfactory experience.Will recommend again to everyone till than i am trying to get hold of the mermaid in me.